Before we could answer, Ante had linked his arm in mine and started telling us the history of a weathered sculpture of St. Anthony overlooking Narodni Trg. Until he’d drawn our attention to it, we’d never noticed the little man at St. Anthony’s feet. Ante explained that this little fellow was the artist’s depiction of himself. Just meters away, Ante also pointed out the west gate of Diocletian’s Palace, explaining that the winged goddess Nike once adorned it. Such tidbits offered a wonderful introduction to Split, and we were happy that we could be Ante’s audience, if only for a few minutes. After he’d shared his select anecdotes the historian bid us farewell and headed home via a limestone lane polished by centuries of feet passing over it. Our kind apartment owner, Novica, is as equally passionate about history. When he was restoring the apartment that we’ve been calling home the past two months, he uncovered an old doorway filled in with Roman bricks. Our building is likely ‘only’ from the 17th Century, so it makes us all wonder who scavenged the now 1,700 year-old bricks from Diocletian’s Palace, and when they did so. Whenever we enter our little apartment, we pass this wall so unintentionally beautiful – comprised of irregular limestones and those Roman bricks. Our pledge is to never take such character for granted. Novica recently allowed us to take a peek at two rare, vintage books featuring images of Split from the early 1900s. 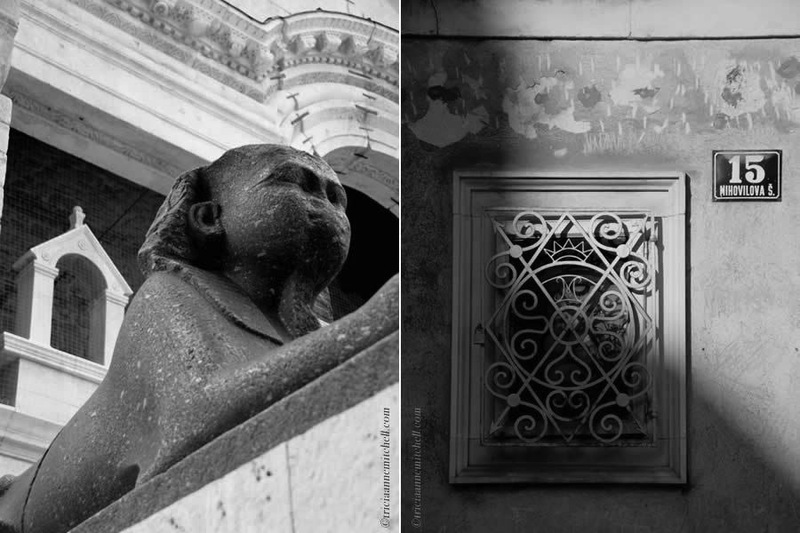 During quiet moments, we’ve carefully turned the books’ browning pages, feeling as though we were stepping back in time onto Split’s black & white streets. So much remains the same, yet little details have changed. It is from Novica and those vintage photography books that I found my inspiration for this piece. May I present Split in Black & White, circa 2014. 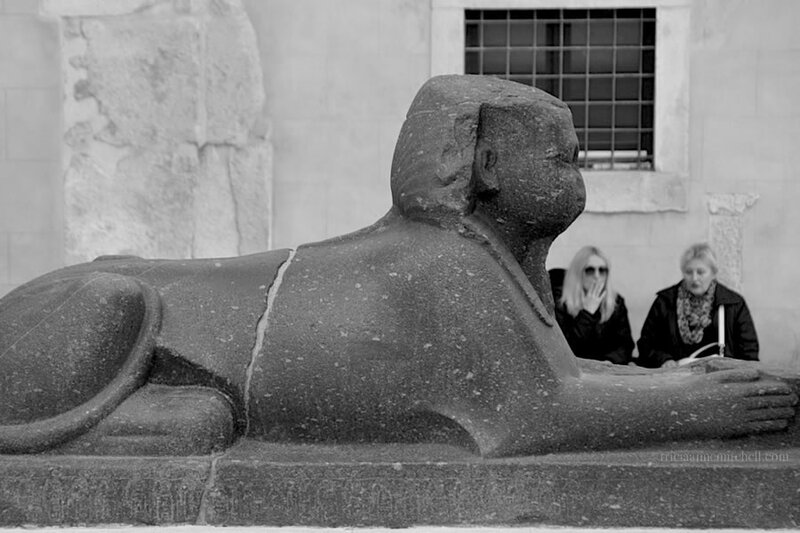 The Roman Emperor Diocletian had sphinx sculptures imported from ancient Egypt to his retirement palace in then-Spalatum (present-day Split). Most of the sculptures were later decapitated by Christians, however, this one on Split’s peristyle remains intact. The belltower of the St. Domnius Cathedral, as seen from the Peristyle (left) and through an arch of the eastern wall of the palace (right). 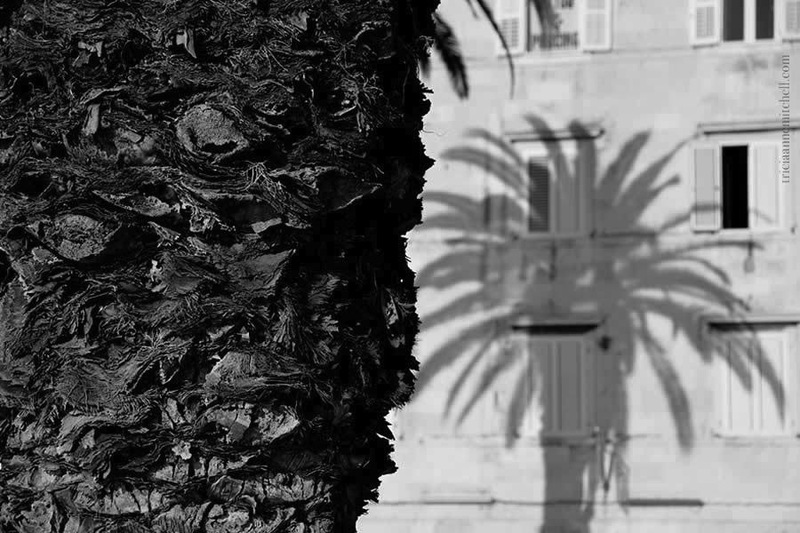 A palm tree’s shadows on Split’s waterfront promenade, the Riva. 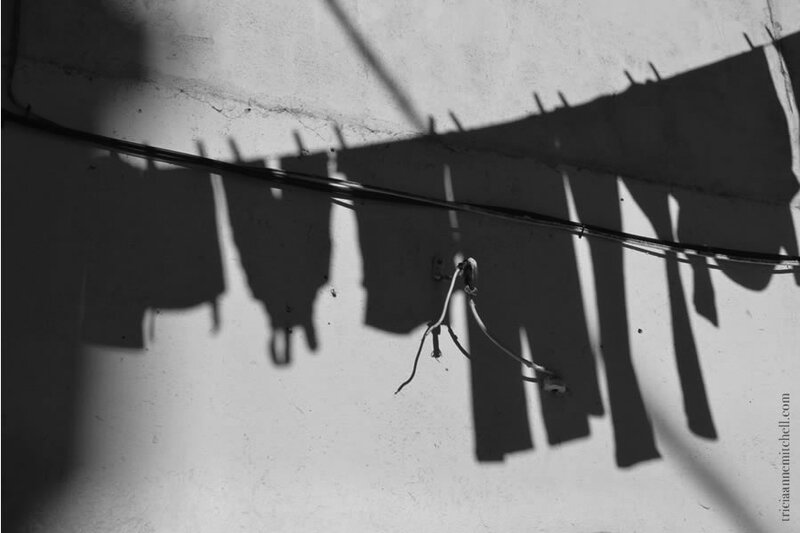 A line of laundry casts a shadow in a Split courtyard. 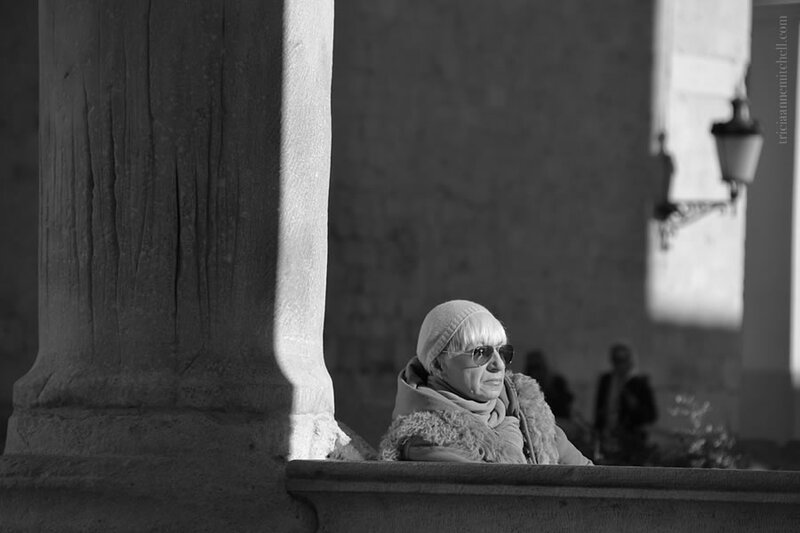 A woman soaks up the winter sunshine on Split’s Peristyle. 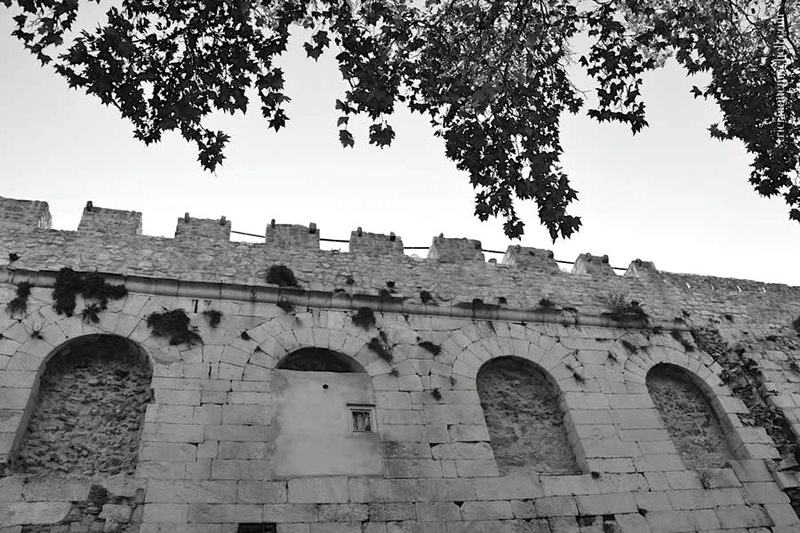 The Golden (northern) Gate of Diocletian’s Palace. The face of the clock tower overlooking Narodni Trg / Pjaca. 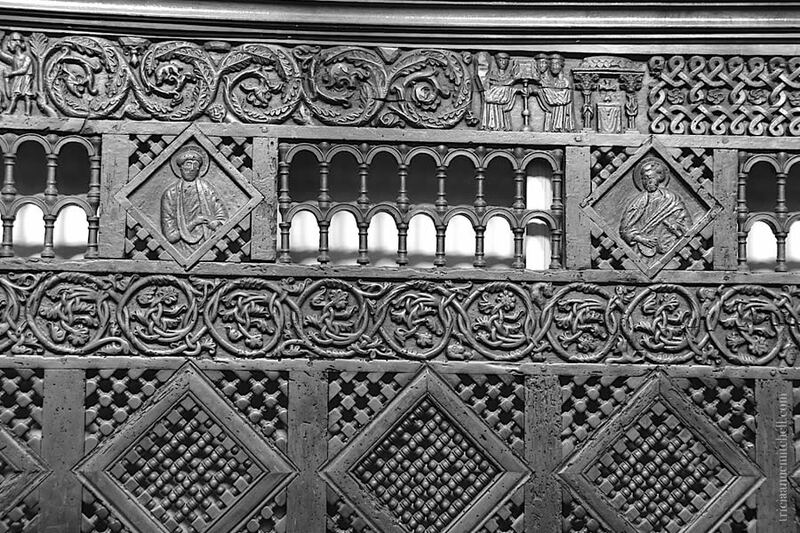 Detail of the choir stalls in St. Domnius Cathedral. 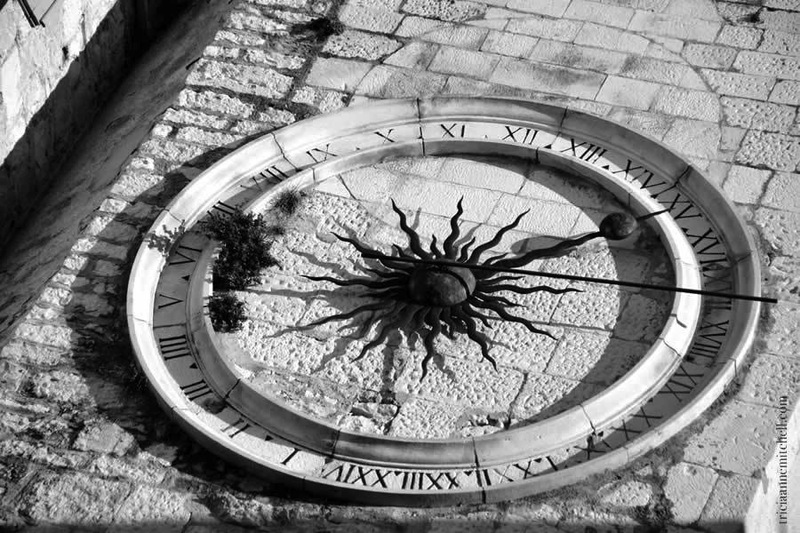 We’ve spent two winters in Split, finding accommodation in apartments that would be packed during the summer months, but are practically empty during winter. During our first 2.5 months there, we stayed at the lovely Kaleta Apartments (affiliate link) which are located within Diocletian’s Palace. Our studio apartment (called the ‘Diocletian’s Suite’) featured much character, including Roman brickwork, and views of Old Town Split below. Owners Novica and Negri were thoughtful citizen ambassadors too. Two years later, we returned to Split, staying in the charming Varoš neighborhood, characterized by stone homes with hunter-green shutters. For those 2 months, we stayed in quaint studio apartments at the Guesthouse F (affiliate link). We especially enjoyed our tiny terrace and the kindness of our hosts, Anja and Miro. One of Guesthouse F’s apartments was originally a horseshoe maker’s workshop, which previously belonged to Anja’s grandfather. Shawn and I dubbed it the ‘horseshoe cottage’. Great collection! I love the B&W! Thanks for sharing! PaigeBrown, many thanks! The black & white treatment was a bit of a departure from what I usually create, but I appreciate how the b&w emphasizes Split’s intriguing architecture. Glad that you enjoyed them, Camilla. Thank you. I love the history and the photos. I do so want to go to Croatia. Naomi, so glad this piece resonated with you! Thank you for taking the time to comment. Here’s hoping you will be able to explore this part of the world sometime soon. Our friends say that autumn is a fantastic time to visit (less crowds, great weather, grape & olive harvest). Looks like a wonderful place, I wish I had seen that side of Croatia when I was there. Thanks for sharing Tricia. What part of Croatia did you visit? I’m guessing it was for work and not a holiday? It was many years ago when the war was on, Zegrab, Gospik and a few refugee camps, I was part of an aid convoy. Sounds like you were doing noble work there, Mark. Here’s hoping only peaceful times are ahead for the region. When you’re there now, it’s hard to imagine that such violent events recently took place. At the same time, however, if you get a chance to speak with the locals, inevitably talk of the Homeland War of the 90s will arise. I believe you have created your own archival book of Split. What extraordinary photographic choices, Tricia. If I had to choose, it would be the woman soaking up the sun. Dramatic picture with the vertical lighting. Greetings Lynne, creating such a book would certainly be a fun project! I’ve come to the conclusion that pictures make the best souvenirs from our travels. A wonderful trip in Croatia. A guided tour for all of us. How cool… It always seems that around any interesting place in the world, there is someone who is waiting to show and give what they can of the place they love. From your posts, I can see you seem to attract such people ~ wonderful post, great photos. Randall, such a phenomenon is what makes travel special, doesn’t it? I’ve been fortunate to have crossed paths with many such citizen diplomats during my solo travels and travels with my husband. I’m not sure what invites it, but I know that traveling slower allows it to happen more easily. In an age of frightening stories in the media, it’s refreshing to know that such kind people are out there. It’s cliché, but it’s touching when complete strangers reach out to give, without expecting anything in return. Very true. Traveling leads to those special opportunities…and they are surprisingly frequent. A dramatic, dream like sequence of events and photographs Tricia. What a wonderful and memorable experience – from out of the blue. V.
Nevertheless, thank you for your lovely comment, and sending happy thoughts your way on this snowy Sunday. SJ, we’ve left Split, and must confess that we’d gotten a bit spoiled by being surrounded by so much history. I know you can relate since you’re still in beautiful Dalmatia. Apologies for such a belated reply – from a bad Apple computer to being on the road in Croatia & Italy, I’m still catching up with comments. Hope you’re enjoying a lovely spring day in Croatia, and thank you again for your kind comment. Lovely atmospheric shots, Tricia. :) I’d probably have liked to see the mellow honey-coloured stone and blue sky but I can use my imagination when I must. Really excellent pictures. The do bring forth a feeling of Split. I love the stark contrast you use in the images – and the way you frame the subjects. They are all wonderfully captured. Otto, belated thanks for your thoughtful comment about these Split captures! Between being on the road and nursing my husband’s computer back to good health, I’ve missed keeping up with my posts and wonderful readers. 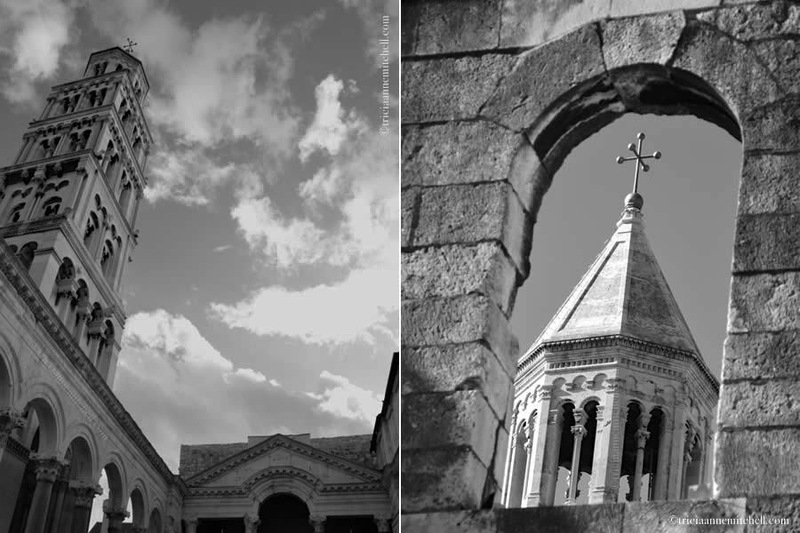 It sounds as though you have spent some time in Split, or in Croatia? If so, I’m curious what your experience there was like. Otto, I hope your trip will materialize soon. Dalmatia certainly makes a nice winter get-away, and we’ve found off-season travel to be especially rewarding. This post is a perfect example of why your blog is so rewarding. Well-crafted words draw the reader in from the personal to the historic. And then the photographs bring it all to life. Loving your map widget thingy too. Hi Rachael, I’m blushing thanks to your flattering feedback. Thank you, thank you!